We have the sweet task of selecting beers that pair well with Cavendish Fruitcake. 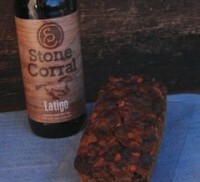 Let's open the sampling with an artisanal brew, Stone Corral's Latigo, a Scotch ale the brewer's describe as "smooth and malty", a friend with cheese and citrus. Shall we add Cavendish fruitcake to the list? Tell us what you think! What do Fruitcakes and Bernie Sanders have in common? Welcome to our new website! This site is easier to navigate than our old one was and and provides the option to use a credit card for payment (rather than just PayPal). The new site also is responsive, so it will work better across all devices. We are excited about the changes and love the new look. Let us know what you think!